Oh, the wealth of gizmos that geeks at MIT have bestowed on the world: radar, Technicolor, stair-climbing wheelchairs, even a battery powered by a virus. See displays of new and once-new technologies created at MIT since the school was instituted (days before the Civil War broke out) in their just-opened exhibition “MIT 150.” You don't have to be in Cambridge to visit. 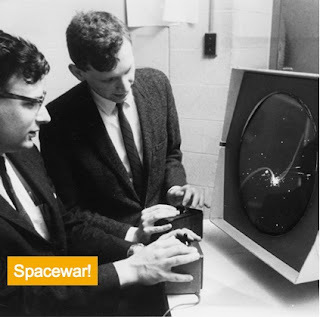 The exhibition’s website lets you browse artifacts like Spacewar!, the first video game created in 1961 on a DEC computer. And Lantern slides, an ancestor of PowerPoint, in which black and white transparencies are inserted into glass “sandwiches.” I suspect it was good news for our forefathers that lantern slides were heavy and had to be toted in wooden boxes—must have kept presentations mercifully short. More on the show from Daniel Grant in today's WSJ.